How are you supposed to drive straight when your wheels are cockeyed? If your car is steering you in the wrong direction, get on the straight path by coming to Wayne's Auto Repair for auto alignments in Powell, OH. We ensure that you drive straighter and smoother again. Wheels that pull and pulsate can mean big problems. If your car pulls to one side while driving or the steering wheel shakes, your safety may be compromised. Not only is your car more difficult to steer, but misaligned wheels cause premature tire wear. You can't risk a tire blowout! With every twist, turn, and bump in the road, your tires become misaligned. At our auto repair shop, our alignment specialists straighten up everything for you again. 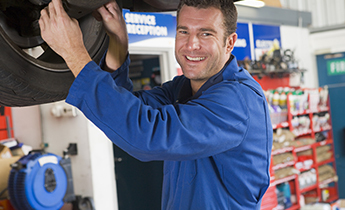 We recommend that you schedule tire alignments on a regular basis. After we are finished, you will notice that your vehicle drives better and handles the road the way it should. You just spent money on new tires for your vehicle. Since tires are expensive, you want to ensure they don't wear out before their time. Save money and save your tires by depending on us for wheel alignments. In addition, balding tires and poor tire tread create driving hazards for you and your passengers. By measuring and adjusting wheel angles, as well as fixing other alignment issues, we eliminate problems that create a shaky and unsafe ride. Safety is essential when you're driving on the road. If your car is pulling to the right or left, your ability to drive is compromised. Visit us for auto alignment services at the first sign problems. In addition, it's a good idea to have your wheels checked for alignment problems whenever you get your oil changed. Contact us for auto alignments when you feel like you're driving crooked. We proudly serve customers in Powell, Lewis Center, Delaware, and Dublin, Ohio.